Anna6Belle: Urban Decay Naked 3 Palette Review + Comparison!! 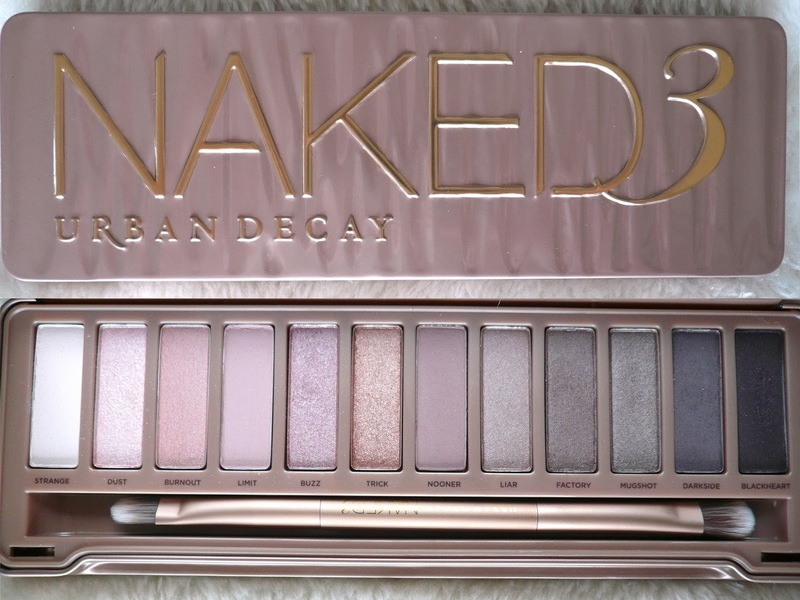 Here is the long-awaited review on the new Urban Decay Naked 3 Palette. I'm personally really impressed with it so I thought I would share with you guys my experience with this palette, as well as a comparison to the previous two Urban Decay palettes. Packaging: Sturdy metal case; keeps the eyeshadows nice & secure, which makes it perfect for travelling. Although they could have been a little more creative with the packaging, as it is too similar to the Naked 2. Shades: Nice range of cool pink neutrals with 2 matte colours, 3 shimmers and the rest have a satin finish. There is a great selection of light and dark shades, so it's great for creating natural day looks as well as smokey evening makeup. My favourite colours would have to be 'Buzz', 'Trick' and 'Blackheart'. Quality: Same great quality as the previous palettes. All eyeshadows are soft, creamy and very easy to blend. 'Dust' is the only disappointing shade as there's just not enough pigment. Texture: Smooth, blendable and easy to work with. I don't get that much fallout even using the darker colours. Longevity: Urban Decay eyeshadows and makeup in general is famous for it's lasting power, and this palette is no exception. My makeup lasts all day, and I'm sure it would last for 2 or even 3 days if I didn't remove it. Value: This palette is £37 at Beauty Bay; contains 12 colours and a two-sided brush. I think it's great value for money considering how long these palettes last. Suitable for: This is one of those palettes that wouldn't be for everyone unfortunately. The colours are too pink based to be suitable for all skin colours and undertones. If you are unsure, then I would highly suggest trying out some pink eye makeup beforehand and only then deciding on whether to invest in this palette. As a general suggestion I would say if you have pale skin with natural cool undertones, then these sort of colours can wash you out and make you look unwell. So definitely try out some pink makeup first to see if it suits you or not! The main difference between the three Naked palettes is in the colours and their tones. The first Naked palette is full of warm golds and bronze shades; the second palette is much more cool with silvers and mauve colours; and the latest palette mainly contains pink/blush undertones. Check out my full review + comparison on both the original Naked palette and the Naked 2! Have you tried the latest Urban Decay Naked palette? What did you think?